Jeep is known for blending off-road capability with superior comfort and convenience and the 2019 Jeep Grand Cherokee embodies everything that the Jeep brand was built upon. The 2019 Jeep Grand Cherokee has sophisticated styling that features its signature seven-piece front grille and a classy chrome accent line below the front intake that wraps around to the profile and gives the 2019 Grand Cherokee a low road presence. 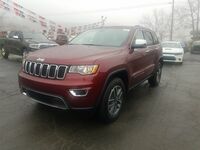 There are also 12 trim level choices to pick from so it is easy for shoppers to find the 2019 Grand Cherokee with the specs and features that they want without blowing their budget. 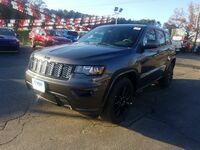 Learn more about the standard and available engine options and interior amenities of the 2019 Jeep Grand Cherokee below and you can climb into the cockpit of the 2019 Grand Cherokee at Cowboy Jeep in Clinton, AR today. What are the Standard & Available Features for the 2019 Jeep Grand Cherokee? The standard engine for the 2019 Jeep Grand Cherokee is a 3.6L Pentastar® V6 that delivers 295 horsepower, 260 lb-ft of torque, and a 6,200-pound towing capacity. There is also the option for a 6.2L Supercharged V8 engine that cranks out an incredible 707 horsepower, 645 lb-ft of torque, and provides a 7,200-pound max towing rating. An available 6.4L HEMI® V8 supplies the Grand Cherokee with 475 horsepower, 470 lb-ft of torque, and also provides a 7,200-pound towing capacity. Inside the cabin there is seating for five people and the 2019 Grand Cherokee provides them with 105.4 cubic feet of overall passenger space to stretch out into. The rear 60/40 split-folding seat of the 2019 Grand Cherokee allows for easy transitioning between its standard cargo space of 36.3 cubic feet and its maximum cargo area that measures 68.3 cubic feet when the rear seat is folded flat. Other awesome standard interior features of the 2019 Grand Cherokee include a 7” Touchscreen Display & Driver Information Cluster, Apple CarPlay™ & Android Auto™, Bluetooth®, and a 6-Speaker Stereo. There is also the option of equipping the Jeep Grand Cherokee with an 8.4” Touchscreen Display, a 9-Speaker Stereo w/ Subwoofer, a Rear Seat Video System, Leather-Trimmed Seats, Heated & Ventilated Front Seats, as well as Heated Rear Seats. You can take the 2019 Jeep Grand Cherokee for a test drive today at Cowboy Chrysler Dodge Jeep Ram in Clinton today to experience all of its amazing specs and features firsthand.